I’ve always been optimistic about the intentions of search companies and the possibilities for more competition in the European search market. At the beginning of this year I wrote a post on State of Search named What Bing needs to bring to the table in 2011 Sadly at the end of this year I have to conclude search in Europe has even more become a one company show. Nor Bing, nor any of the other competitors like Yandex, Yahoo!, Blekko or Wolfram Alpha has taken even the smallest slice from Google of the search pie. Yandex chose a more slow and steady approach. First they started by improving international search. Secondly they improved their product and adding extra unique functionality, like the taxi search and Yandex.Translate. Then slowly they started rolling out there product to more Eastern European countries, for example by rolling out Yandex video search in Czech search engine Seznam and entering the Turkish search market. And they became the default search engine on Windows Phones and Samsung devices in Russia. Check out Yandex press releases page for more interesting strategic choices they’ve made. Despite all their efforts Yandex isn’t anywhere near a viable alternative for Western European users and even lost a large amount of market share in Russia in the last year, making Google the no.1 search engine in Russia with 60%. And Blekko and Wolfram Alpha are useful search engines but serve only specific purposes. 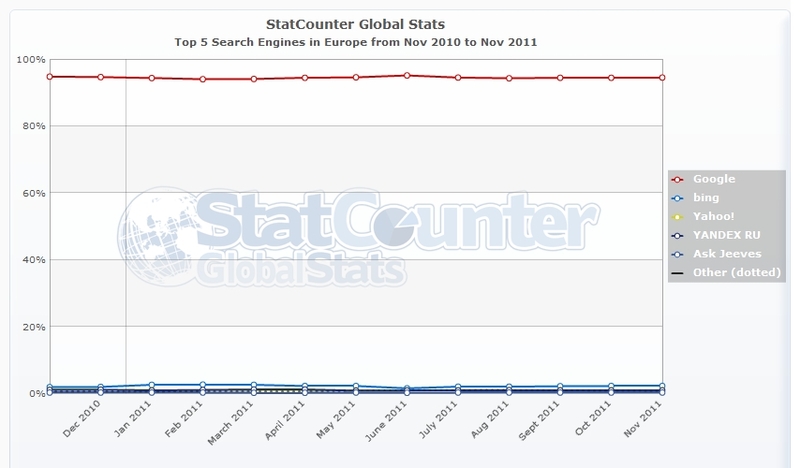 Edit: These statistics of search engines in Russia are based on Statcounter data. According to a representative from Yandex this data is incorrect. Liveinternet.ru shows Yandex is still (by far) the number one search engine in Russia. So Europe is still completely Google minded and change isn’t anywhere near. Luckily Google is becoming more than just a search engine. Slowly it’s becoming a bundle of different vertical search engines, including verticals like shopping, places, videos, images, news etc., for all of which you can optimize your results. Within the web search engine Google also offers more ways to optimize your search results with rich snippets, author information, site links etc. So for 2012 instead of keeping an eye on Google’s competitors, if you were at all, keep an eye on the different verticals of Google and spot your opportunities there. And if you’re lucky I might just update my overview of resources on optimizing for each of those verticals anytime soon. While there is no doubt that Google is the dominant search engine in Europe, I’d dispute that it has managed to overtake Yandex to the no. 1 spot in Russia – the latest stats that I’ve seen had Yandex with 62% of market share – something I wouldn’t expect to change any time soon! Thanks for your reply. My source is statcounter: http://gs.statcounter.com/#search_engine-RU-monthly-201011-201111 And I have to add I was a little surprised by these stats. Which source do you use?